Flyers interim coach Scott Gordon had a one-game-at-a-time approach as a player. "It has extended to my coaching career," he said. The worst cliché in sports is this: We’re taking it one game/day at a time. Athletes and coaches spout it all the time. Scott Gordon lived it. Before he became an NHL head coach – first with the Islanders, again with the Flyers this season – he was a goaltender with the East Coast Hockey League’s Johnstown Chiefs, 25 years old, on what he figured was the last stop of his playing career. Just go out and enjoy every day, he told himself. A year and a month later, in 1990, he was in the NHL, playing for the Quebec Nordiques. He wasn’t kidding. Twice on Thursday afternoon, Gordon was asked about the Flyers’ recent 16-victories-in-21-games roll that raised their chances of making the playoffs from Let’s see if this snowball survives in Hell to Let’s see if Steph Curry misses this free throw. Then the Flyers spotted the Capitals a fistful of goals Wednesday night and lost 5-3, and their already-remote postseason hopes took a substantial hit. In fact, they dropped from 4.3 percent to 2 percent, just because of that one loss, according to the database SportsClubStats.com. But that game was all Gordon could see. It took up his entire view. The Flyers didn’t clear the puck or move the puck, and goaltender Brian Elliott struggled to stop the puck, and the only context in which Gordon mentioned their hot streak was to point out that they hadn’t been playing so sloppily before Wednesday. Of course, Gordon is in a spot that makes it natural for him to narrow his perspective. He is the Flyers’ interim head coach, after all, and his status with the club beyond this season’s conclusion remains uncertain. It would seem, at the moment, the biggest question ahead of the Flyers’ offseason: Will Gordon be back? And the more games he and the Flyers win now, the better it is for him, though someone did ask him: The team had gone winless in eight straight games before embarking on that 16-3-2 stretch. Didn’t that turnaround alone say something about the job you’ve done? He won’t be the only one evaluating, though. General manager Chuck Fletcher, team president Paul Holmgren, and franchise CEO Dave Scott will be, too. And if they’re doing their evaluating right, they should consider a broader view in a manner that Gordon can’t or won’t. Flyers general manger Chuck Fletcher has to take a longer, broader view of the team's history, makeup, and potential. For instance, they should consider that last season, under Dave Hakstol, the Flyers rebounded from a slow start with a 16-5-1 stretch from early December into mid-January, then were eliminated in the playoffs’ first round by the Penguins. They should consider that, under Hakstol in 2016-17, the Flyers went on a 10-game winning streak – and still failed even to qualify for the postseason. They should consider that, in 2015-16, Hakstol’s first season, the Flyers needed a 12-3-2 run just to get into the playoffs. And they should consider that, in 2013-14, under Craig Berube, the Flyers went 39-21-10 over their final 70 games, including a 12-2-1 burst late in the season – and, yes, lost in the first round. The purpose in noting those other spurts of success is not to argue that Gordon hasn’t done a good job this season, or that he is a better or worse coach than either Hakstol or Berube. It’s to offer a reminder that the Flyers have ripped off victory after victory over a 10-to-20-game period before, and it’s a safe bet that, during their similar stretches of excellence, Hakstol and Berube thought their people-management and work-delegation skills were pretty darned solid, too. One way or another, though, the term regression to the mean is worth keeping in mind. This season, the Flyers’ rebirth coincided with Carter Hart’s near-instantaneous emergence as an elite NHL goaltender. It was more than a coincidence, actually. As much as the players may have benefited from a new voice in Gordon or a new system or a revamped lineup, Hart was the primary and obvious reason for the improved results and the whispers of a miracle run to the playoffs. That’s an awful lot of pressure to place on a 20-year-old rookie, and it’s still a big presumption that Gordon, the latest in a long and varied list of Flyers coaches, has unlocked something special that his predecessors couldn’t. 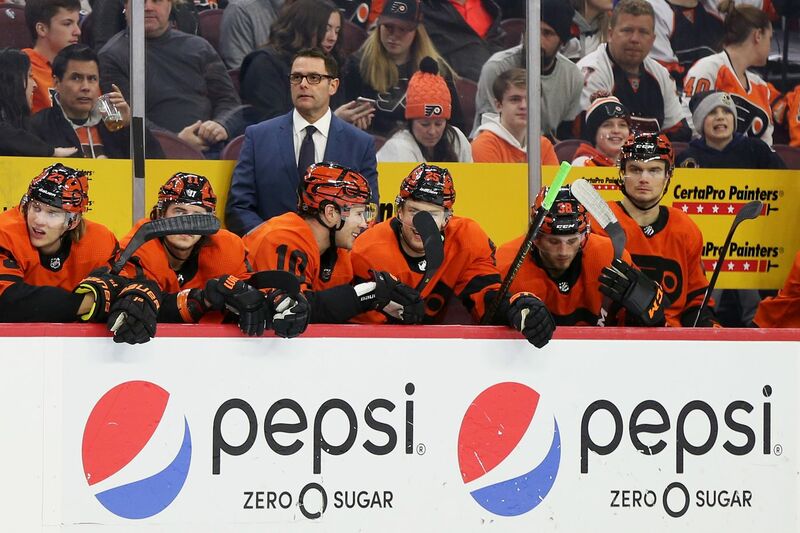 The Flyers’ decision-makers will do themselves no favors if they don’t take a clear and unflinching look at the entire roster this offseason, if they decide that a 16-3-2 streak necessarily signifies that this team turned a corner. A great young goalie solves only so much for so long. It’s fine for a head coach to have Scott Gordon’s kind of tunnel vision. The people above him can’t.